Michael Essien was on hand to provide the current Chelsea crop with some supportive words of advice ahead of Friday night’s clash against Liverpool at Stamford Bridge. The Ghanaian midfielder has been training with the west London club after being released by Greek side Panathinaikos in the summer transfer window. Essien was no stranger to tense clashes against Liverpool during his Blues career as the two Premier League giants regularly did battle on domestic and European fronts. The 33-year-old scored 25 goals in 256 appearances in all competitions for the west London side during an eight-season stay at Stamford Bridge. Chelsea will host Liverpool at Stamford Bridge on Friday night as Antonio Conte’s side look to make a swift return to winning ways following a 2-2 draw with Swansea City last weekend. 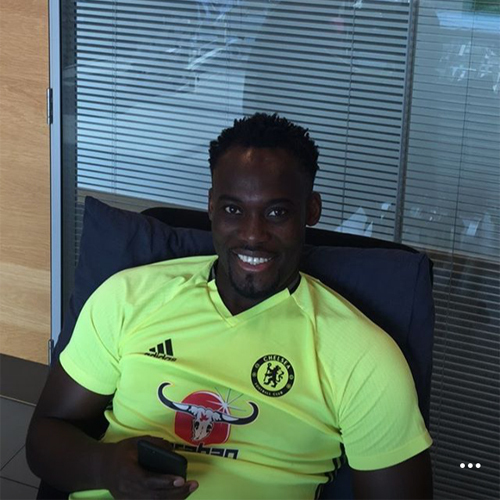 And Blues skipper John Terry posted a photo of Essien on his Instagram story on Thursday evening as the African relaxed at Cobham training ground ahead of Chelsea’s clash against Liverpool. Essien won two Premier League titles, four FA Cups, two League Cups and the Champions League with Chelsea.